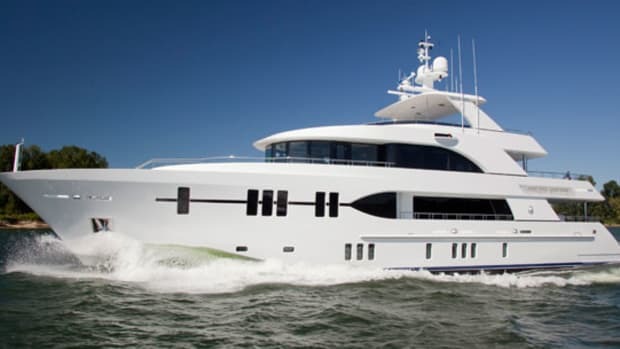 This 83-footer out-Punches Poseidon on a foul test day. The sky was as gray as a battleship, and raindrops the size of marbles fell so hard onto the wooden-plank dock beneath my feet that the water hit me coming down and bouncing back up. Winds were out of the northeast at 25-mph-plus, and waves were forming eight-foot vertical walls just outside of Fort Lauderdale’s Port Everglades inlet. A great day for a boat ride, I thought with a healthy dose of New York sarcasm, as the rain soaked my clothes through to my bones leaving me feeling like a sponge. 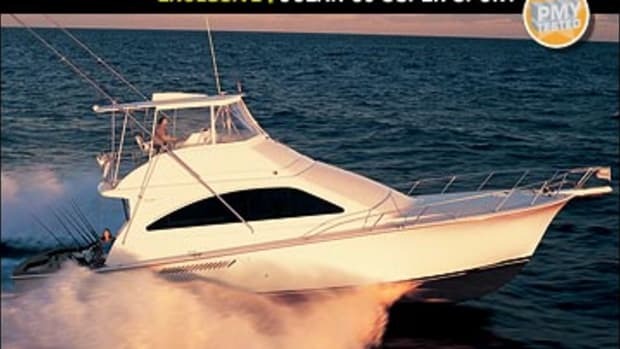 While I worried that this sea trial would be one of those victory-at-sea days, my confidence in a positive outcome grew as I gazed at the 83 feet of motoryacht across the dock from me. 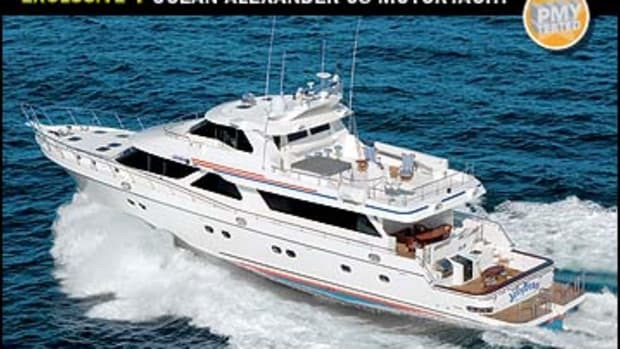 She was the latest launch from Ocean Alexander, and taking in her muscular look and brawny 20-foot beam, I was comforted by the fact that she at least appeared like she’d been designed to go out and get home on dismal weather days like this. And indeed she was. The 83’s semi-planing hull form comes from longtime Ocean Alexander collaborator Ed Monk Jr. Its shape starts with a steep entry designed to make incoming waves (say, eight-footers) impact well aft of the bow, creating a soft landing when blasting through head seas. 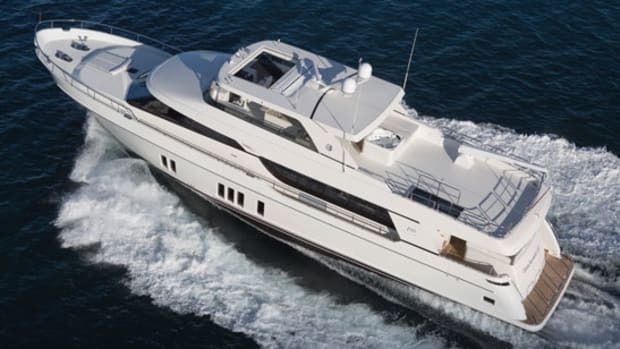 The fine foresections are also designed to prevent the 83’s bow from plowing, enhancing efficiency. Long spray rails and a pronounced bow flair are employed to keep her dry, and considering all the rain, wind, and waves on test day, they did a good job. This seakindly hull form is supported by a solid-fiberglass bottom laminate that’s infused with carbon fiber (as is the 83’s deck) for added strength without added weight. Above the waterline, Airex PVC foam core is sandwiched between fiberglass laminates for additional impact strength, sound attenuation, and thermal-insulating properties. Adding to this impressive combination are foam-filled and carbon fiber-reinforced fiberglass longitudinals and transversals that add rigidity and backbone. It all sounded and looked reassuring, but eventually it was time to watch this motoryacht move some water. The tide was rushing into the inlet against an outgoing wind, causing a steep chop in the last few hundred yards before we entered the open ocean. Two optional Seakeeper M7000 gyros (see “Noteworthy,” this story) did a solid job of minimizing roll during our slow-speed departure. And then it got interesting. Just past the jetty the seas were a steady six feet, yet the 83 cruised along between 1250 rpm (13 mph) and 1500 rpm (14.9 mph) simply piercing and dispatching the water without a bang or a bump. Ocean Alexander captain Clyde Hensley jogged our test vessel further offshore until the seas and relentless downpour prevented a view back to the beach. Then the waves grew bigger. A couple of miles from the inlet, we were motoring head first into eight-footers, yet once again the 83 dismissed them. I can’t honestly recommend heading out in these conditions, but I was reassured to see that this yacht’s claim of being an offshore-capable cruiser was coming to fruition. Hensley found a comfortable route to run so we could attempt to gather speed, fuel, and other data. Amazingly, he actually managed to find a heading that enabled him to get the boat to WOT once (albeit briefly). With optional 1,650-bhp Cat C32s humming below decks (1,600-hp MTU 10V2000s are standard), I recorded an average 2000-rpm cruise speed of 20.4 mph while the motors burned 114 gph. This gives the 83 a cruising range of 322 miles based on a full 2,000-gallon fuel load and a ten-percent reserve. I think her long-distance sweet spot, however, is 1250 rpm, where at 13 mph and a 30-gph fuel burn, her range more than doubles, to 777 miles. At WOT (2314 rpm), the 83 managed a top hop of 26.7 mph but a 178-gph burn seriously shortens her range: try 270 miles. We repeated the speed runs in the calmer water in the inlet, where I also noted that she planed quite easily, which Ocean Alexander attributes to her hull form, as well as proprietary prop tunnels and an exhaustive pre-build tank-testing schedule. As impressive as her hull and construction were, the 83’s Caterpillar power played a strong supporting role in her performance. These big motors seemed almost small in the vessel’s expansive engine space, which features better than 6&apos;8" headroom. A 32-inch-wide aluminum diamond-plate walkway between them and diamond-plate steps aft of each motor (one step up and one back down) provide good access to the outboard sides. All the way outboard of each Cat is a standard 32-kW Northern Light genset, while between the motors and gensets is a line of battery boxes. Everything is accessible. In addition to bright overhead lighting, the area also benefits from natural light entering through portholes on either side of the Cats. Duplex fuel-water separators for the mains are easily accessed on the ER’s forward bulkhead, but I wish the fuel tank sight gauges were as easy to see. To view them, you have to walk all the way to the forward bulkhead and look all the way outboard to each motor. The 83’s saloon, which is accessed from the optional teak-covered cockpit via a pneumatically operated sliding door (very Star Trek), is just as spacious. Entering it I was immediately struck by the contrast between the boat’s traditional motoryacht exterior styling and her contemporary Euro-inspired interior, which was adorned in light oak veneer accented with dark, rich, high-gloss wenge trim. A cocoa-colored carpet added to the upscale feel as did the galley’s standard stainless steel Jenn-Air refrigerator, convection oven, Fisher & Paykel dishwasher, and four-burner Gaggenau electric cooktop. One thing I could’ve done without is the standard dayhead, which is to starboard in between the saloon and galley. When sitting in the pilothouse behind the wheel in the electrically adjust-able Stidd helm seat, visibility is restricted to starboard and aft. Moreover, I think the head makes the saloon and galley areas feel smaller than they really are. 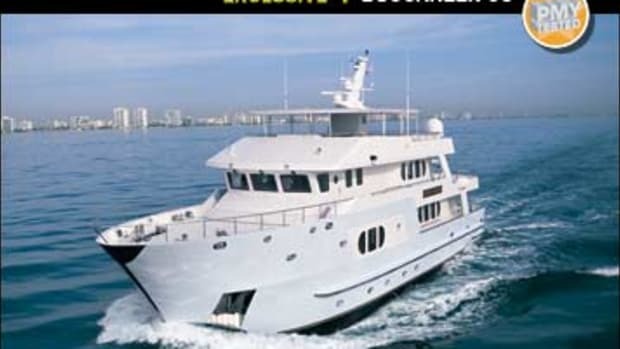 Fortunately it can be deleted, consistent with the fact that Ocean Alexander is happy to customize its vessels to each owner’s desires (even up to moving some bulkheads). I believe the resulting open floorplan would both enhance interior volume and prove more functional, and you could even add a pass-through to the saloon from the galley. On the other hand, I have no criticism of the 83’s accommodation spaces; they’re spot-on for a large cruising family. From her full-beam master aft, complete with his-and-her heads, to the mirrored port and starboard guest staterooms (both of which have 31-inch-wide, six-foot-long, side-by-side berths), she’s setup for serious voyaging. 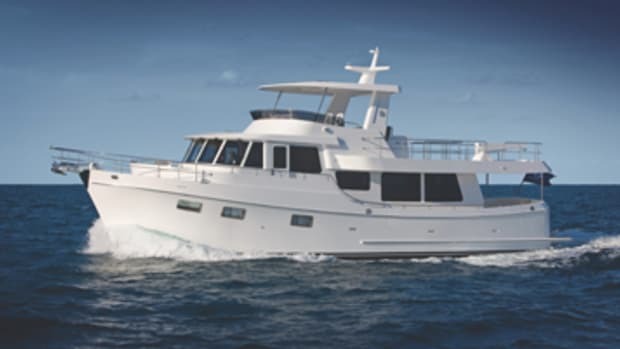 Her forepeak VIP is well-appointed and bright thanks to two 11.5-inch-wide portholes and a Bomar hatch over its queen-size step-up berth. The crew quarters, adjacent to the engine room, sport two single berths beneath which are the optional Seakeeper gyros. 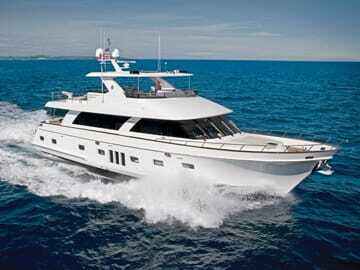 My Ocean Alexander 83 certainly proved her mettle on test day. Her handling was solid in a seaway, and she offered a good turn of speed when conditions permitted. 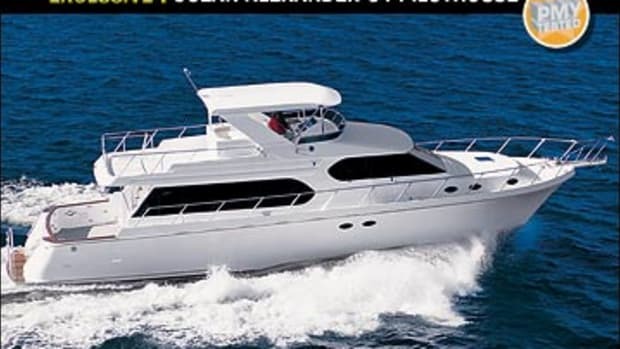 Add to this her substantial range when her engines are dialed back and enough living space for a big family and crew, and you have a boat that is about as close to a total package in this size range as you’re likely to find. 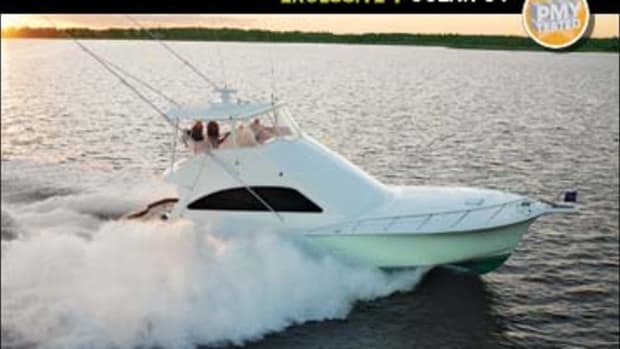 If all this sounds enticing, I suggest a sea trial in late January or early February when a nice northeaster is kicking up and the skies are slate gray. Because even under a dark sky, the 83 shines bright. See enhanced photos on Facebook. The sea state may have deteriorated throughout the morning of our boat test, but our four-man crew stayed on its feet thanks to the prodigious torque produced by two optional Seakeeper M7000 gyros. (A larger version called the 21000 is also available.) Measuring 31.4"Lx8.7"Wx26.4"D, the units, which were located under the vessel’s crew berths aft of the engine room, spin at 10000 rpm within a virtual vacuum, creating enough righting force to significantly reduce roll, even on a boat of this size. I could actually feel the boat stop rolling as the gyros, which take about 45 minutes to spool up to their rated rpm, took hold. And unlike traditional fin-type stabilizers, there’s no underwater appendages to add drag or snag nets. Moreover, Seakeepers are equally effective whether you’re underway or on the hook. 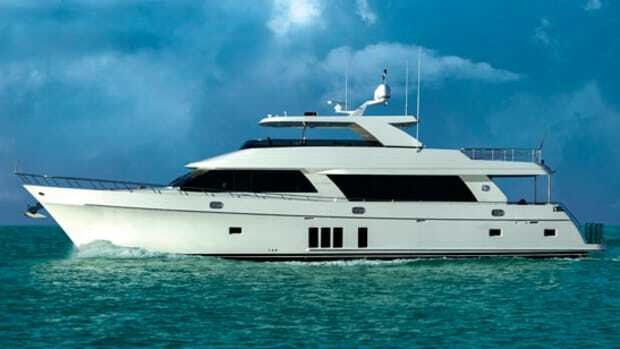 This article originally appeared in the April 2010 issue of Power & Motoryacht magazine.